13 Assassins is nothing less than an old-fashioned samurai movie in color. You might even call it Seven Samurai II (or x2 is almost as appropriate). The slow, character-oriented first half of the film is just like that of class Kurasawa, making the second half all the more dazzling when it slams the viewer into 21st century filmmaking. Takashi Miike uses opposing perspectives of the same samurai ideology to juxtapose violence as a necessity against violence as a luxury. Without a doubt, Miike has created some of the greatest samurai battles ever committed to film. 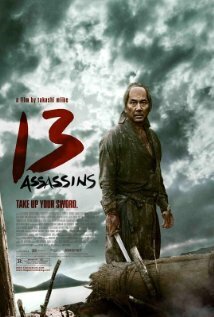 Unfortunately, 13 Assassins appears lacking in deep, profound thematic material.